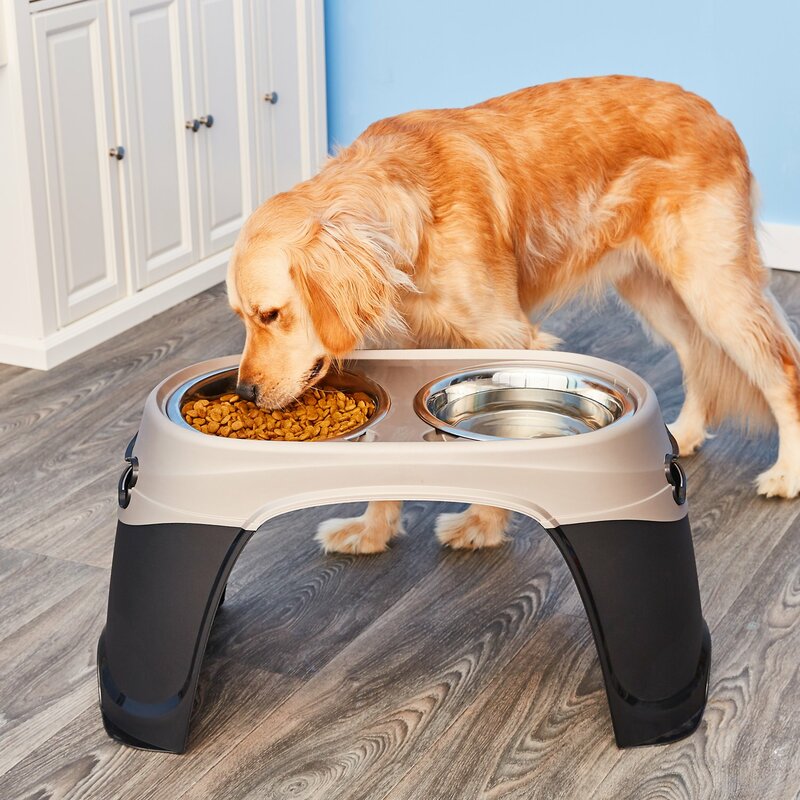 Take pet dining to a new level with the Easy Reach Diner elevated feeder and waterer! Tall dogs will benefit eating and drinking from elevated bowls, which prevent stooping and associated discomfort. 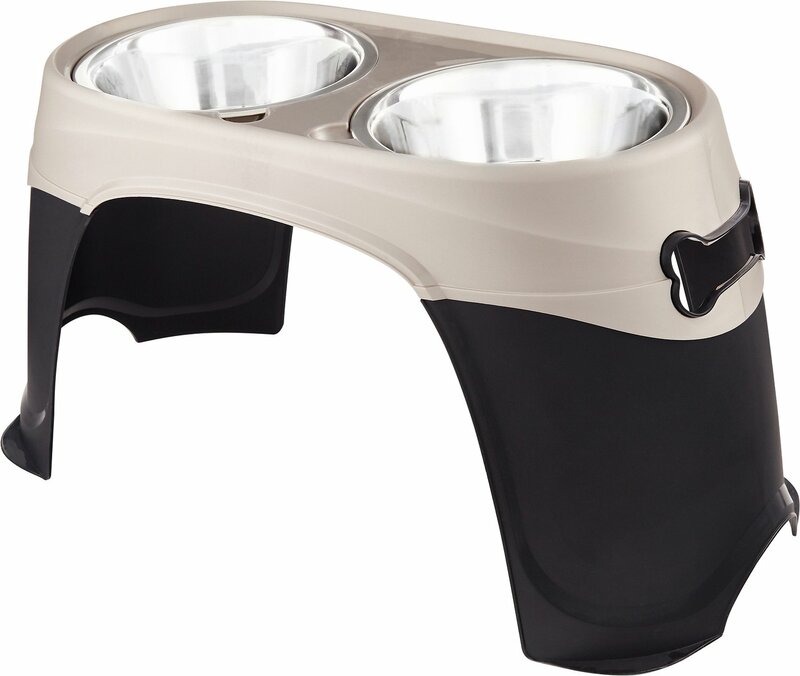 With removable stainless steel bowls for easy cleaning and anti-rattle bumpers for bowl noise reduction, the Easy Reach Diner is a win for pets and pet owners. Taller dogs require an elevated feeder, this will prevent stooping and discomfort. Removable stainless steel bowls are dishwasher safe. Ideal for tall dogs and large breed dogs. Made with plastic, very easy to clean. 28.3 x 13.6 x 14.5-inches stand with two 96-oz bowls. This was a good purchase. I have a 70 pound lab mix and it's the perfect height for her. I was worried it might be flimsy at first, but it's really solid and holds a lot of food and water. One of the bowls came with a small dent in it, but I wasn't bothered enough to return. The bowls are thinner, but I don't find it to be a bad quality. I would recommend this. I love it and my dog loves it! My only issue is when we travel, because it doesn't collapse. But, it's a quality product and the bowls are huge! Great for keeping a full water bowl. The whole thing itself is light weight but very sturdy. It’s the perfect height for my 55lb dog. Bowls don’t bang around when he eats or drinks. Easy to remove them. Perfect for my 4 year old, over-sized Rottie. He's so tall that he used to spread his feet apart to get to his food and water. Now he can comfortably eat and drink. The unit is very sturdy, stable, and reasonably priced. I don't usually get this excited about products, but this one works so well for my baby, that I've taken the time to write this review. I definitely recommend this product. It has rubber around the edges so the bowls don’t clang around. Bowls are nice and big, but flimsily made. Perfect height for my 85 lb boy. But it did take a couple of days for him to get used to it. I ordered 2, i have 3 dogs. 2 labs and a spaniel, less mess to clean up after feedings and they arent bending over to eat. Bowls are very large so works great to feed multiple dogs or extremely large dogs. I have a Great Dane/Mastiff "puppy" that is almost two years old. He had outgrown the elevated bowls that I purchased when we brought him home. I wanted something big enough that he didn't have to bend down. This set is perfect! It's sturdy and holds enough food and water to almost last the whole day. Well my girl won't touch it. I removed the bowls and she eventually approached them but she doesn't want anything to do with the stand. I'm not giving up though. I'm just going to incorporate the stand back once she's really use to the bowls. I recently purchased two of these bowls two replace older ones for my two GSP's. The height is perfect for my dogs as they prefer a slightly elevated bowl. I had a 17 inch feeder which was too high. As soon as I opened the box and set them up they went right over to them for a water break. I like the fact that the bowl is in an open slot and I have a waterproof mat under each. The only thing that could be improved is the rubber bumpers that come with the stop the noise from the bowl. The one on the water dish already came up when I took the bowl out to refill. Still a great purchase at a reasonable price.